Cluster bomblets pose a "persistent humanitarian problem"
BAGHDAD, Iraq (CNN) -- Two U.N. agencies said Wednesday they are concerned that Iraq will not be able to meet its obligations under the global treaty to ban landmines. Landmines are laid out after being turned in at an Iraqi police station in 2004. A report from UNICEF and the U.N. Development Program, released along with the Iraqi Ministry of Environment, says it will take decades to clear all mines and unexploded ordnance in Iraq. As a result, Iraq will not be able to meet the 2018 deadline for clearing all areas containing, or suspected to contain, anti-personnel mines, the report said. "This report makes abundantly clear the enormity of the task ahead and that more must be done," said Iraqi Environment Minister Narmin Othman. Iraq's signature of the Ottawa Mine Ban Treaty came into force in February 2008. Since then, national and international demining organizations have managed to clear about 12.5 square miles (about 20 square kilometers), the report said. But nearly 1,055 square miles (1,700 square kilometers) of Iraq's land is still contaminated with landmines and cluster bomblets, the report said. 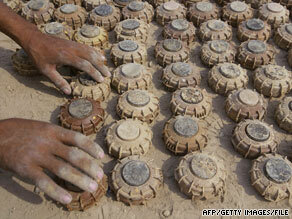 It estimates some 20 million landmines and 2.66 million cluster bomblets remain to be cleared. While Iraq has had a mine clearance program for several years, the report said, it is hampered by a lack of reliable data on the impact of mines and exploded remnants of war, which can disguise the scale of the problem. Insecurity in Iraq has limited the scale of mine clearance operations, it said. There is no legalized oversight authority or regulatory framework for mine clearance in Iraq, which hampers operations, and the Iraqi Ministry of Defense has currently suspended civilian demining operations, the report said. "After decades of war and conflict, Iraq has become one of the world's most contaminated countries in terms of landmines and unexploded remnants of war, impacting the daily lives of hundreds of thousands of Iraqis," said Paolo Lembo, UNDP's country director for Iraq. "Unfortunately, with the government's current capacities and resources, it is unlikely Iraq will be able to meet its obligations under the Antipersonnel Mine Ban Treaty, as it will take decades to clear all mines and unexploded ordnance." By signing the treaty, Iraq committed never again to use, produce, acquire, or export antipersonnel mines. It has also stated its commitment to destroy stockpiled mines in four years and to clear minefields in 10 years. The report says about 1 million Iraqi children are at risk of being injured or killed by mines and unexploded ordnance. Some 2,000 children -- a quarter of all victims -- have been maimed or killed by cluster bomblets since 2003, the report said. "Iraqi children have the right to grow up in a safe environment without risk to their well being and lives as much as any other child in the world," said Sikander Khan, the UNICEF representative in Iraq. "More action to clear mines and other unexploded ordnance is urgently needed so all Iraqi children can grow up without fear of this hidden enemy and be assured of a safer and better future." Cluster bomblets are contained in cluster munitions, widely considered an inaccurate and unreliable weapon with effects that last long after the end of conflict. The International Committee of the Red Cross (ICRC) has called cluster bomblets a "persistent humanitarian problem." The munitions break apart in flight to scatter hundreds of smaller bomblets, most of which are meant to explode on impact, but many do not. Credible estimates show the weapons fail to explode on impact between 10 percent and 40 percent of the time, according to the ICRC. That means unexploded bomblets lie scattered across a target area, often exploding only when handled or disturbed -- posing a serious risk to civilians.